Our first stop is Masumo on Lake Victoria. the lake is immense, brimming with graceful white sailed dhows. We are at Tembo Beach and have been allocated rooms in small hotel, as storms regularly take out the tents here. Nonetheless, three hardy souls have pitched theirs. Paint is peeling off the floor and there’s only cold water, but I’m in paradise. Nile perch for tea and a stunning sunrise. Over the border from Kenya into the Serengeti. A frustrated lion is batting away vultures surrounding his kill,as we arrive. He’s not very keen on us either. Hot air ballooning down The Great Rift Valley is an absolute doddle after the white water rafting, very gentle, serene, absolutely fantastic. The gazelles below, leaping along with us and the hippos heads bobbing in the blue pools. I would have done it again the next day if I could. It’s a shame Robert Redford wasn’t at the controls though. The Serengeti is vast, and as rewarding as the Mara. a bone-rattling, dust-filled drive to Ngorongoro, where we take jeeps into the crater. It’s a little quiet after all the animals we have seen already. 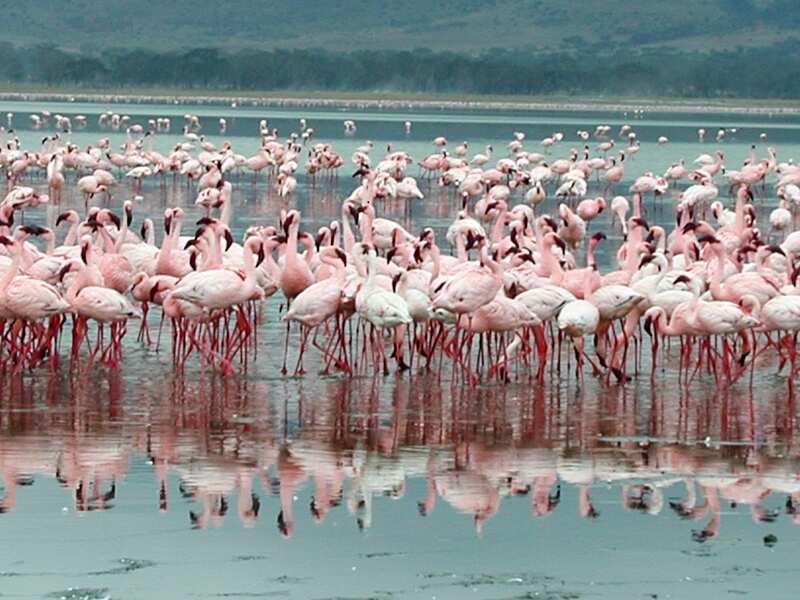 There is dik-dik, zebra, wildebeest (the wildebeest migration is in full flow) and hosts of flamingos. 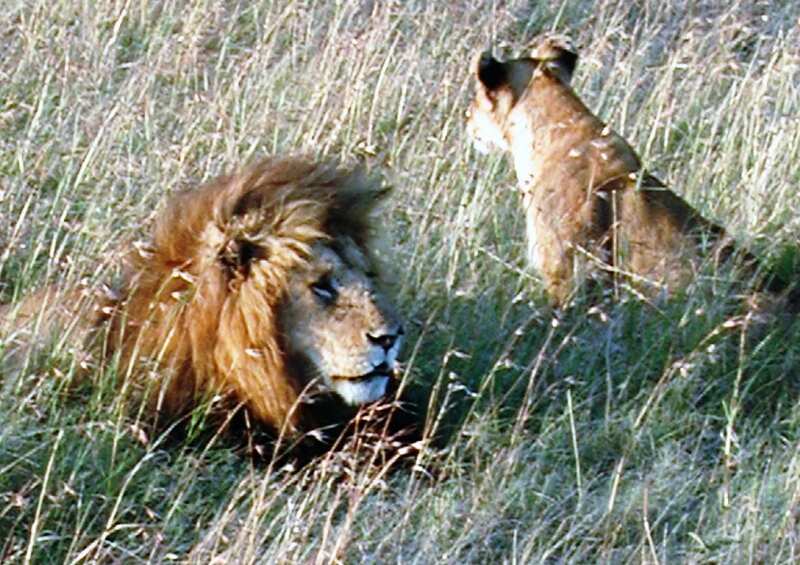 A lion and lioness perform a scene from the Lion King on a rock platform for us. 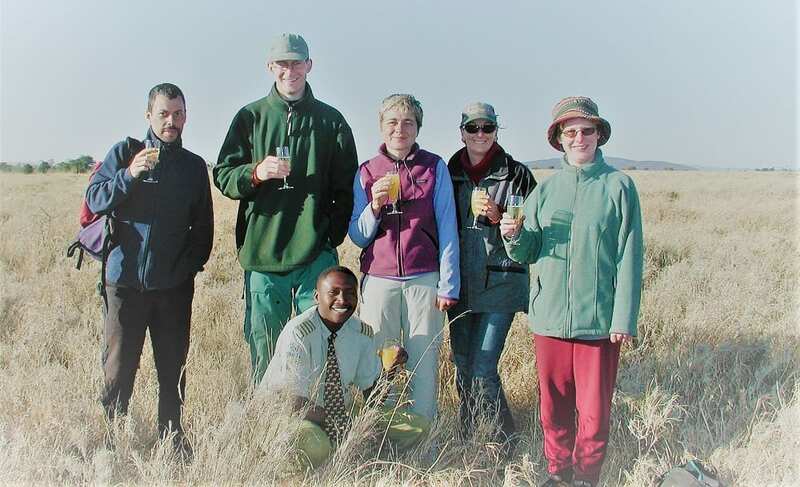 It’s also freezing at night-we are high up here on the plateau in our bush camp. I sleep in all my clothes and borrow a hot water bottle. Buffalo, zebra and elephant surround the tent. What am I complaining about? Across Tanzania, through Arusha to Merangu, camping on the slopes of Mount Kilimanjaro. As usual the volcano is elusive and we have to imagine what it looks like without its cloud shroud. It’s still really cold. Jon has embarked on an instant romance and jumped ship to join a GAP truck full of young things. Past sisal plantations, scenes straight out of an Ice Cream War. On to bustling busy Dar es Salaam and a ferry to the Spice Island – Zanzibar. At least the camping’s over thank God. Hotels from now on, but the bumpiest of roads to rustic bungalows on the northern beaches.Comfort, snorkelling and sunbathing. 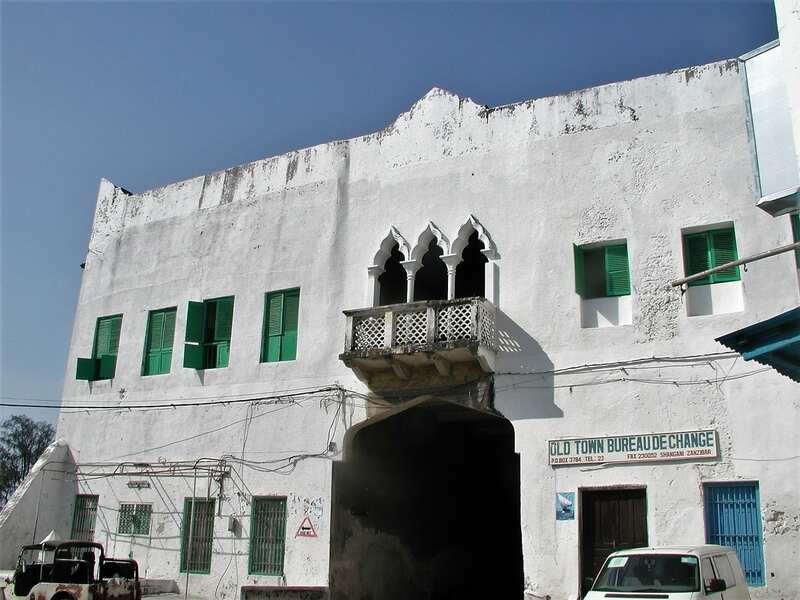 The oldest part of Zanzibar city, Stone Town is a labyrinth, an exotic fusion of Asia and Africa. If you discount the Internet cafes. Then I’m off to the east for some time all on my own. On the way I stop off at a small reserve to see the rare red colobus monkeys who ignore us and feign sleep, hammock-like between two trees. I’m flailing, trying to get a good picture before I’m hauled back by my guide who has noticed a deadly green mamba, also flailing, but in my direction. The beaches are colourful, sprinkled with hibiscus. 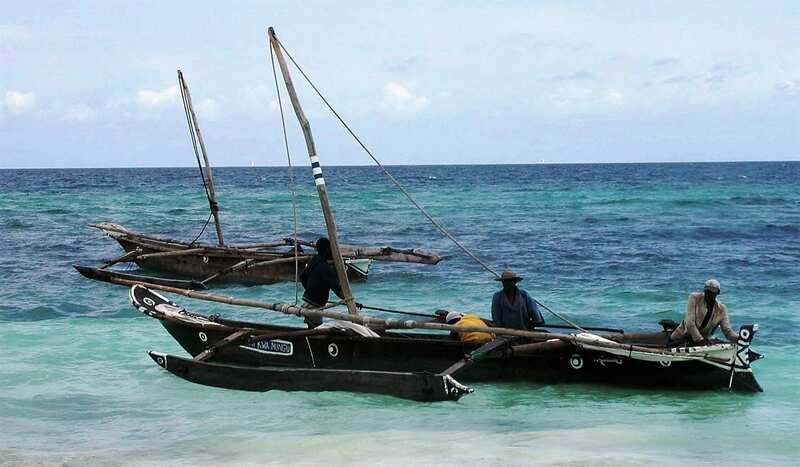 The fishing dhows with their distinctive triangular sails swoop up and down the coast. The hotel is remarkably comfortable. Massage and prawn coconut curry. And it’s a very small world. I go snorkelling and spend eight hours afterwards -we just went ‘for a drink’ -with Phil, from Dar, who turns out to be the cousin of a previous travelling companion from Brighton. The next day, dialogue with the lady on the adjacent sunbed reveals that she was once a student of my ex, Neil. The flight home is on Ethiopian Airlines via Addis and is eventful. I get my view of Kilimanjaro-the pilot flies so close to the peak that I can see the trekkers on the winding paths. On the next leg we are struck by lightning. 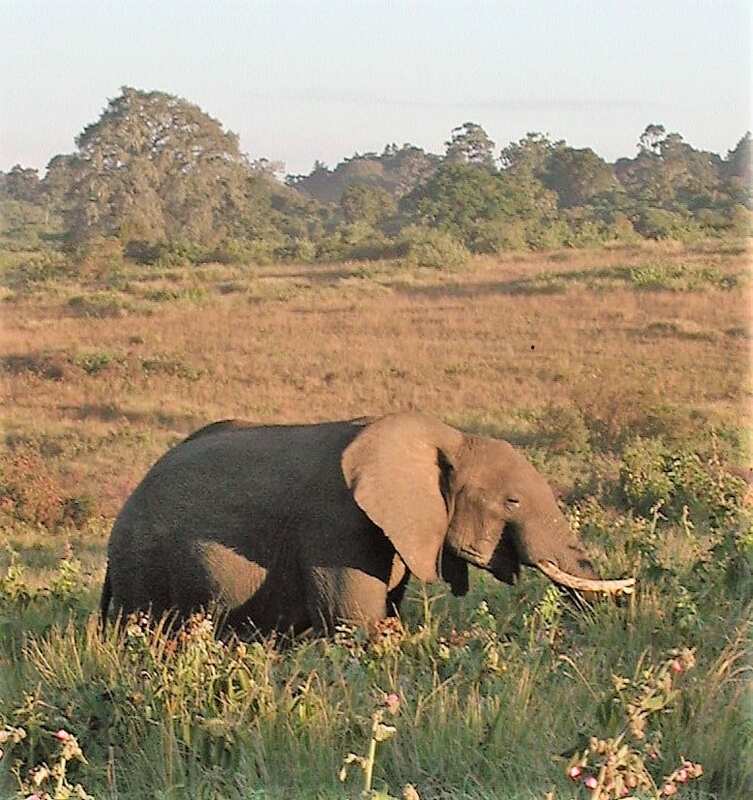 To see more of my photos of Tanzania, visit this page. 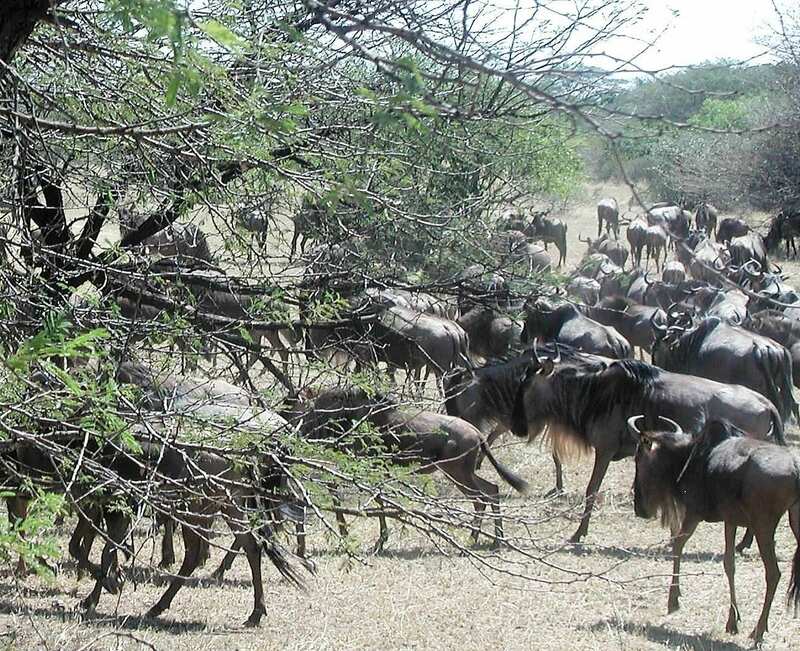 Tanzania has the largest concentration of wildlife per square kilometer in the world, with more than 4 million wild animals and representatives of 430 species and subspecies.